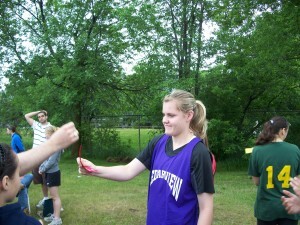 Today I went to the Regional Track and Field Meet. 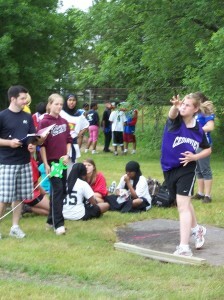 I only competed in the Shot Put event. There were about 30 girls in my division. Everyone gets three throws and then the 8 girls with the furthest seach get one more throw for the finals. I won first place. Right after the meet I came home so I could have a little rest and pack for the weekend since I have a soccer game tonight. To be honest I just want to get to Oakville right now and start the tournament. I’ve found it really hard to concentrate on school with all the other activities and training. I’ve been going to school really early in the mornings for events and then getting to bed after midnight every night. I’m just going to rest all day tomorrow in the car and then when we get to the hotel. Friday night we have to weigh in and then then the tournament starts at 8:00 am and will last all day on Saturday. Sunday is another round robin of black belts to select the national sparring team for New Zealand. I’ll keep you posted with how it goes. Wish me luck 🙂 🙂 ! GOOD LUCK in Oakville. Can’t wait to hear how it goes!